There is much to learn from financial mania’s. In particular, the role of human behaviour responsible for inflating asset prices to previously unimaginable heights. Economist Robert Schiller has done some excellent work on this topic in his book Irrational Exuberance. In essence, Schiller highlights a few key themes. Mainly that real estate booms seem just as mysterious and hard to understand as the stock market booms when they happen, there are always popular explanations for them- explanations that are not necessarily correct, but people love a good story. Meanwhile, higher prices tend to drive a positive feedback loop where initial price increases lead to more price increases as the effects of the initial price increases feedback into yet higher prices through increased investor demand. This second round of price increases feeds back again into a third and then a fourth round, and so on. A recent publication from CMHC highlights strong human behaviour dynamics have been playing out in the Vancouver & Toronto Real Estate markets. After surveying 30,000 recent homebuyers, CMHC found evidence of euphoric and perhaps irrational behaviour. For instance, respondents were asked about whether how much they paid was aligned with their plan budget. Respondents were also asked about a series of choices regarding location, size and timing of purchase. Choices all potential homebuyers must consider before buying a home in both Vancouver and Toronto, 48% of homebuyers respectively spent more than they budgeted. CMHC believes home buyers may have experienced a fear of missing out, citing that homebuyers measure the value of a home through rule of thumb mechanisms like, “it’s a hot market, I can’t miss out, it’s really tight right now-will have to revise our budget if we want to get in” all of which are phrases pushing homebuyers to overvalue an investment. Survey results also show about 55% of buyers experienced a bidding war in Toronto and Vancouver. Which is slightly higher than current data which shows 32% of Vancouver homes sold over the asking price in May, 2018 largely concentrated in the condo space. 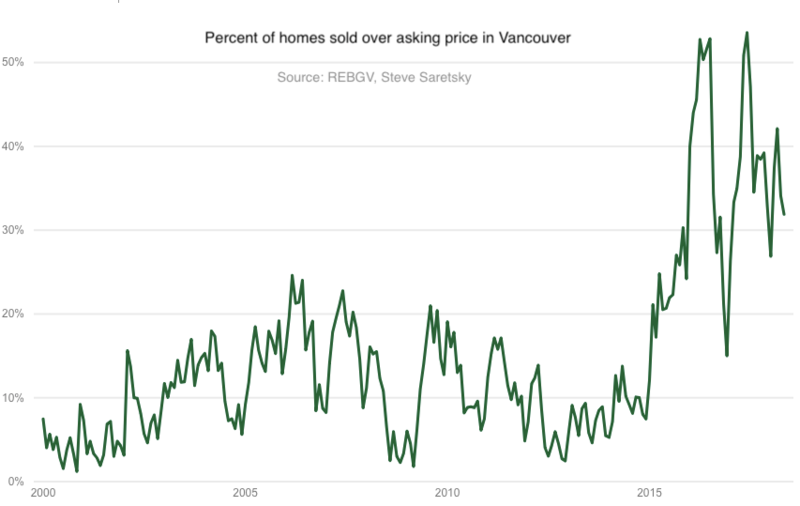 The report also finds that nearly 68% of respondents in Vancouver believe foreign investors have a lot of influence and driving up home prices while 48% respondents in Toronto believe and foreign investors have a lot of influence driving up home prices. 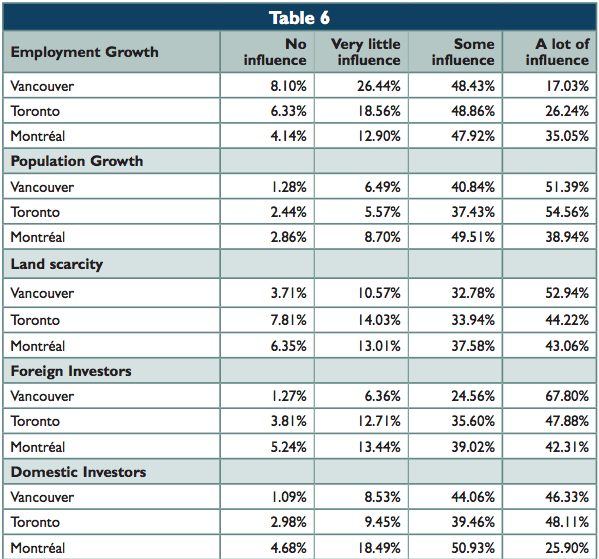 In Vancouver, the influence of investors is perceived to be stronger than supply constraints and demand-side factors. Now you can see why foreign buyer taxes have been so popular.